Wake up, work out, smoothie. It’s my morning routine 95% of the time and I’m hooked! This smoothie has been on repeat since the beginning of the year and I’ve definitely perfected it. 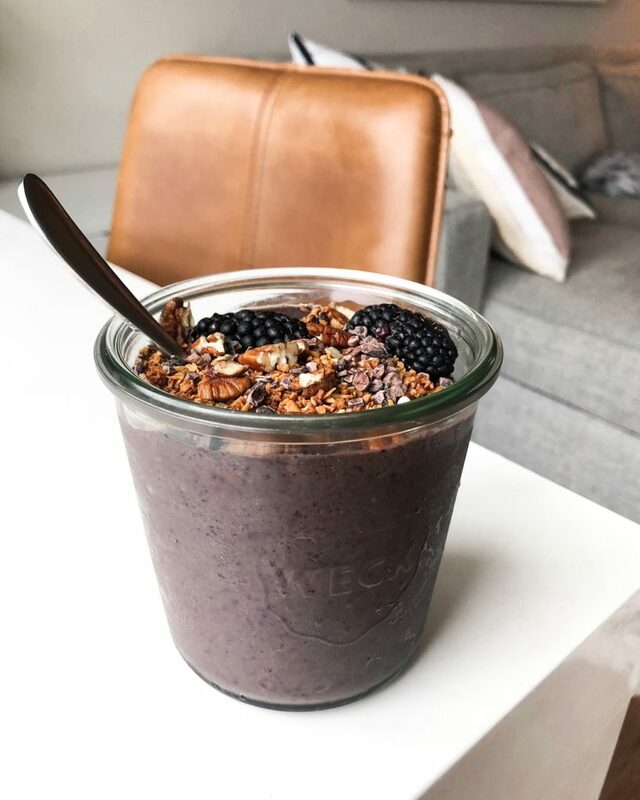 It’s the right amount of healthy superfoods to refuel my muscles after a workout, keep me full all morning, and maintain my glowy-looking skin. A definite winner in my book. I always stick with an unsweetened nut milk, always! So many sugars tend to hide in most flavored (even unflavored) nut milks, so I make sure the carton states, “unsweetened.” Next up is about 1/3-1/2 cup frozen fruit to further keep it low-sugar. I like to include organic blueberries or raspberries most often for the combination of antioxidants, nutrients and flavor. Next is my greens & fiber: frozen spinach and either ground flax, hemp seeds or chia seeds. I prefer frozen spinach (I typically just buy two bags organic spinach at the store and toss one straight in the freezer for my smoothies. It keeps great!) because I find it hides the flavor better, it adds coldness to the smoothie & it blends better. Try it out! The flax/hemp/and or chia is for a boost of fiber, omega-3’s and plant based protein. I’m kiiiiind of a big chocolate fan, which is why I like to add cacao. I shared all the benefits here in a recent blog post. It’s sugar free and adds the perfect touch of chocolate flav. 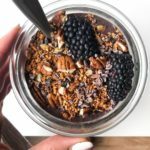 I’ll add cacao nibs in the smoothie, as well as on top for a yummy chocolate “chip” texture. The cacao nibs are a bit bitter FYI! Exclude if you prefer not to have texture in your smoothie. Ceylon cinnamon is one of my most used spices in my cabinet, hands down. It contains antioxidant, anti-inflammatory and antimicrobial effects and in my opinion, has such a stronger flavor compared to plain cinnamon. I often go with the Simply Organic brand. Lastly, I’ll add a quality plant-based protein. I’ve spent the past few years struggling to find one with good flavor / not chalky / and not super processed since my stomach is overly sensitive. I can become bloated immediately after consuming certain vegan proteins. I finally found one that I love– Nutraorganics. It’s based out of Australia… but what great product isn’t?? We also use this protein as a vegan option at Toast Society, my café in Las Vegas. Shipping is very expensive, but I’ve been in touch with the company and they should be coming to Amazon SOON! 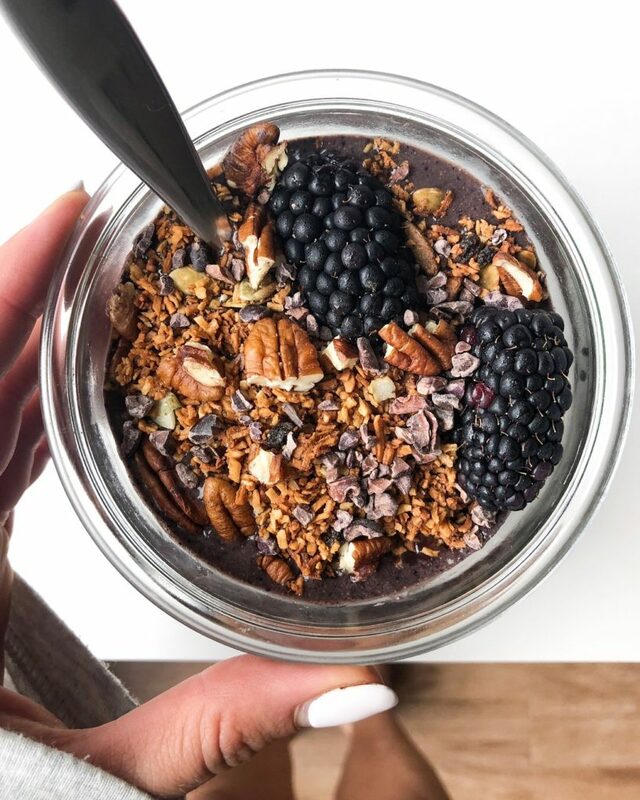 Blend all ingredients & top with grain free granola and crushed pecans. Enjoy! Hi! Do you ever add oats to your smoothies? I like MALK best due to its few ingredients, followed by So Delicious coconut milk, Califia and New Barn 🙂 I also like making my own!